The graphics card is the most determining piece of hardware of your system when it comes to impacting your overall PC performance. If your graphics card (dedicated or integrated) is old with mediocre specs, you’ll most likely be prohibited from accessing new and hot applications and games. If you don’t have the money for a brand new GPU, you might be able to fool your system by faking a VRAM increase. Most of the errors generated by a lacking graphics card have something to do with the video RAM (VRAM). VRAM is a special type of RAM that is responsible for holding on to information that the GPU needs. It enhances performance by allowing the GPU to fetch info and beam it to your monitor in a hasty matter. VRAM is much faster in performing GPU related tasks because it’s specifically built for this high-intensity purpose and it’s physically much closer to the GPU. You’re probably aware that integrated graphics card are budget-friendly but come nowhere near to the graphics output of dedicated solutions. But keep in mind that having more VRAM won’t necessarily enhance the performance of your computer. Having insufficient VRAM means that your system needs to make use of standard RAM – this translates into performance drops, lower frame rate, texture pop-ins and other things of this kind. If you are prevented from running certain games or applications because you have insufficient VRAM, you have a few ways forward. Of course, the best way of increasing your video RAM is to buy a new graphics card. If your dedicated GPU is outdated or you’re still relying on your integrated graphics card, upgrading to a new GPU model will give a huge boost to the overall performance (if you have CPU and RAM good enough to sustain the growth). However, in the event that you don’t have the money for an upgrade, there are two other ways that you can use to increase the dedicated VRAM of your GPU (at least on paper). Feel free to follow whichever method seems more approachable considering your particular situation. Before you begin the process of faking a VRAM increase, it’s important that you don’t lose track of the real count. Here’s a quick guide on seeing the amount of video RAM (VRAM) that you have on your computer. Note: The steps below were created with Windows 10 in mind but you’ll most likely be able to recreate them on older Windows versions. For additional help, refer to the Note paragraphs under each step. Press Windows key + R to open up a Run box. 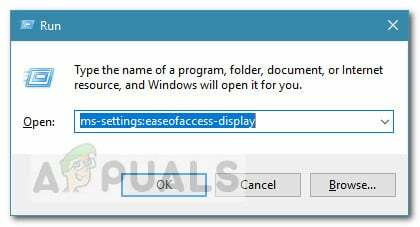 Then, type “ms-settings:easeofaccess-display” and hit Enter to open the Display tab of the Settings app. Note: For Windows 7 and Windows 8, replace the command above with dpiscaling and hit Enter. 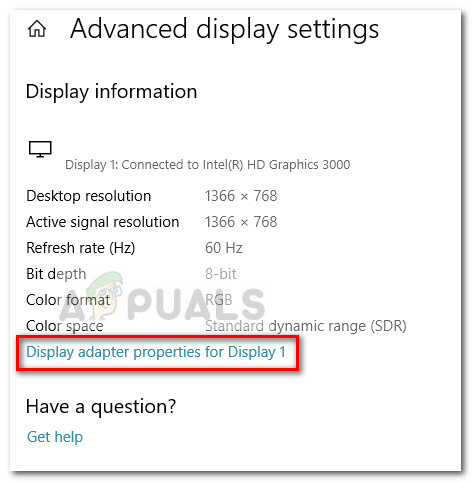 Scroll down and click on Advanced display settings, then click on Display adapter properties for Display 1. You can check out your VRAM count under Adapter information at Dedicated Video Memory. But keep in mind that if you have both a dedicated GPU and an integrated graphics card, this window will show you the integrated solution if your PC is in idle. Note: If you’re dedicated GPU is idle, you can force your system to switch to it by performing a stressful activity. Also, you can access your dedicated GPU utility (e.g. NVIDIA Control Panel) and see the dedicated Video Memory from there. The first and the most recommended make-do solution is to adjust the VRAM allocation from your computer BIOS. Sure, this method is not applicable on all motherboards, but most manufacturers include an option tweak the VRAM allocation. Restart your computer and enter the BIOS settings at the next startup by pressing the dedicated BIOS key repeatedly during the bootup. Try pressing F2, F5, F8 or Del key repeatedly. If that doesn’t work, search online for specific steps on entering the BIOS settings in relation to your motherboard manufacturer. 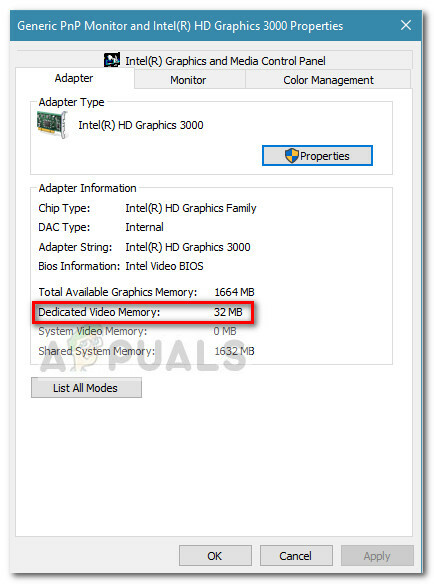 Once you reach the BIOS menu, look for a menu similar to Graphics Settings, Video Settings or VGA Share Memory Size. You can typically find it under the Advanced menu. Then, up the Pre-Allocated VRAM to whichever option suits you best. 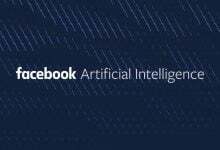 Save the configuration and restart your computer. At the next startup, use the procedure above to see if the VRAM count has been increased. If this method wasn’t applicable or you’re looking for a different approach that doesn’t involve altering BIOS settings, continue down to Method 2. Keep in mind that for most integrated graphics cards, the amount of VRAM reported in the Adapter Properties window is completely irrelevant for the actual performance since the system will automatically adjust it on an on-demand basis. Note: Keep in mind that the following steps are only applicable for integrated GPUs from Intel. Press Windows key + R to open up a Run box. 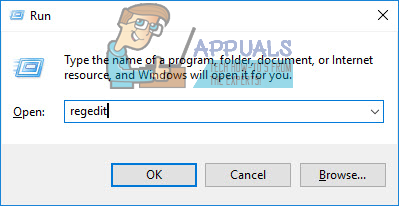 Then, type “regedit” and hit Enter to open Registry Editor. Right-click on the Intel key and choose New > Key and name it GMM. 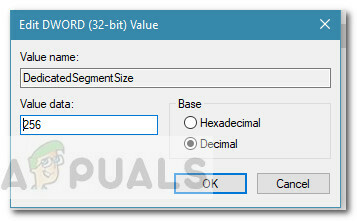 With the GMM key selected, move over to the right pane and select New > Dword (32-bit) Value and name it DedicatedSegmentSize. Double-click on DedicatedSegmentSize, set the Base to Decimal and insert a value from 0 to 512. 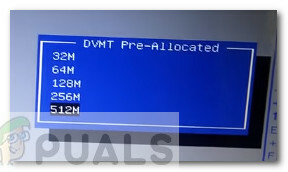 This value will be the amount of VRAM displayed inside the Adapter Properties menu. Save the changes and restart your computer to enforce the changes. At the next startup, see if you can start the game without the error.